Is there any logo you’d tattoo on yourself in exchange for free food? Billy Durney of Hometown Bar-B-Que stands onstage during the Food Network & Cooking Channel New York City Wine & Food Festival in NYC in 2018. Now, The Wichita Eagle brings us news that a 58-year-old diner regular tattooed that diner’s name inside a cheeseburger on his forearm in exchange for free burgers for life. Ty’s Diner had reportedly offered this deal for more than a year with no takers, until its owners asked regular customer Mark Klamm if he was interested. He agreed, joking that he might be going through a midlife crisis. This started The Takeout staff talking: What branded food item would you tattoo on your body—in a reasonably visible place—in exchange for free food? We’re not talking artistic renderings of radishes or a cartoony hot dog, but corporate food items, with a name brand or logo. I immediately thought of Taylor Provisions-brand breakfast ham, which is not only delicious but is also synonymous with my home state of New Jersey. Or maybe I’d go with the Miller High Life girl-in-the-moon logo in homage to one of my favorite yellow fizzy beers. 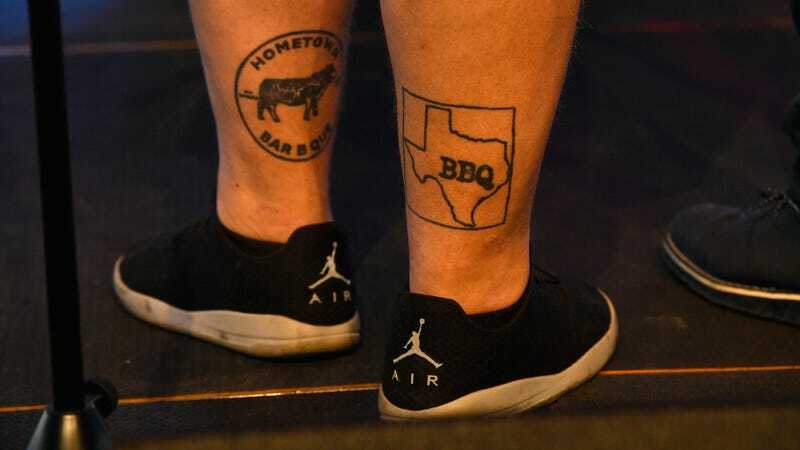 Surely there are more than a couple Whataburger, Dairy Queen, or Cheetos tattoos out there—so what would your branded food tattoo be? Naturally, if you already have such a tattoo, we request to see the photos (PG-rated only, please) in the comments.